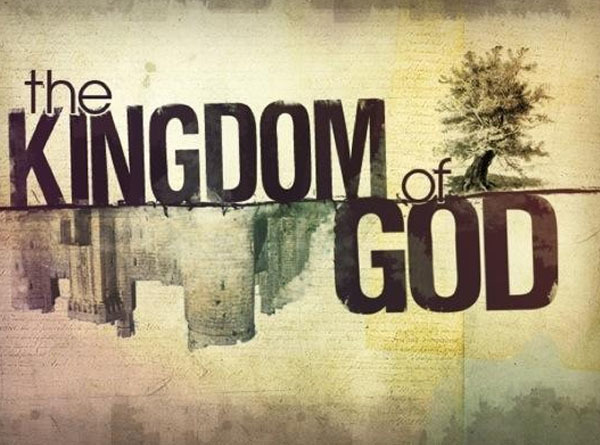 The Kingdom (or Reign) of God is the realm in which God’s will is actualized. Thus heaven is a part of the Kingdom of God, angels are citizens in the Kingdom, animal life and all creation (generally speaking) are within the Kingdom of God. It is only people and evil spirits who, through their resistance to God’s will, find themselves outside of the Kingdom of God. People come to inhabit the Kingdom of God when their wills become aligned with God’s. Thus, the Kingdom of God is available to any who are willing to surrender their will to God’s. When a person makes their will, their mind and their body available to God as tools in the hands of his will, then they are living in the Kingdom of God. Such union of wills connects the individual to the very life and power of God, thus filling them with unearthly peace, strength and love. This is the fruit, the harvest, the result of the Spirit’s indwelling. Those who live in the Kingdom of God, are filled with the Spirit of God, for this interactive relationship is what God wills, and it is impossible for a person to do as God wills without this live connection. Frank Laubach spoke particularly of what he learned from Islam’s emphasis on the submission of the will to God--which is the moment of entry into the Kingdom, when the individual will submits itself to God’s will and thus their own life in all its dimensions become included in the range of God’s effective will (Letters from a Modern Mystic, 3). His ensuing life experiment in attentiveness to presence and reality of God was the outcome of a will in the Kingdom of God exercising it’s authority to bring the mind into the Kingdom. On the simplest level, for me to live in the Kingdom of God I must simply choose to do what God desires. Obedience is Kingdom Living. But this type of will-driven obedience is only kindergarten in the Kingdom of God, for it represents a new-born will, still struggling to draw the rest of the person (the mind and the body, in particular) into the Kingdom with it. Carnal habits of mind are my greatest obstacles to living in the Kingdom of God. This includes everything from distraction toward indulgence to preoccupation with self. I easily fall into the thought-rut of dwelling on the kingdom of me and the kingdom of others which I still seem to believe I must strive against for my wellbeing. These habits of mind continually offer me cheap and easy comfort and abandoning them is like starving a pet rat, it is undeniably unhygienic but I’ve grown accustomed to its companionship. Living completely in the Kingdom of God now means that I am intentionally (will) placing my life in God’s hands and pursuing obedience while living in the conscious (mind) awareness and even bodily experience of the reality, presence, power and goodness of God. This surrender and awareness, which are the bedrock of kingdom living, result in the experience of unconditional peace, joy and love, enabling me to treat all people with unpreferential love (social) and all things as belonging to God. I have certainly not attained this, though I am committed to pursuing it. “Eternal life” is as much a description of salvation’s nature, as it’s duration. We could just as well call it boundless-vibrant-divine life. Whereas the Synoptic gospels (Matthew, Mark and Luke) speak frequently of the Kingdom, John parallels this by speaking of zoe life, eternal life, abundant life, which is clearly of a different character than typically biological life or even mere consciousness. Life lived forever as most know it now should hardly be considered “good news” as those who commit suicide demonstrate. The good news of the Kingdom is not simply “You can live forever and never die” but that the character and quality of your life can be rich, abundant, overflowing, and yes, unending. Like a fountain that doesn’t stop producing water, eternal-abundant life overflows, it exceeds the edges that are meant to contain it. “Living water,” I understand, was simply a phrase used in biblical times to refer to flowing, bubbling or moving water. This in contrast to water in a well or a cistern which was still, stagnant and clearly not a source, but a receptacle. Heidi Baker conected to the Iris Ministries and seeing revival in Mozambique seems to know what it means to live in the Kingdom of God. She sees results of eyes, ears healed. Raising people from the dead. Food multiplied. Well worth looking up. Revival on a wonderful scale.